This is such a crisp, fresh and delicious snack! The sweetness of the red quinoa, the crunchiness of the Kale & Quinoa Burger and saltiness of the miso dip makes for a wonderful combination. This is a slightly different way of serving our burgers, rather than using a bun. It is a great option for a light lunch or quick snack! You can also make the quinoa ahead of time and keep it in the fridge for when you need it! Place the Kale & Quinoa Burgers on a baking tray and cook for 15-20 minutes. Add quinoa and 160ml water to a saucepan; cook over high heat until starts to boil. Reduce the heat to medium-low, cover and simmer until the quinoa is tender and the liquid has been absorbed, about 15 minutes. While the quinoa is cooking, whisk olive oil, red wine vinegar, honey or maple syrup, garlic, salt and black pepper together in a large bowl. Remove quinoa from heat, then immediately add half of the vinegar dressing while fluffing the quinoa with a fork; reserve remaining dressing. Cover and refrigerate quinoa until cool. As the burgers are cooking, dice the pepper and red cabbage, wash the gem lettuce and separate the leaves onto a plate. Mix the lemon juice, miso paste and soy sauce in a bowl. Serve in a small ramekin. 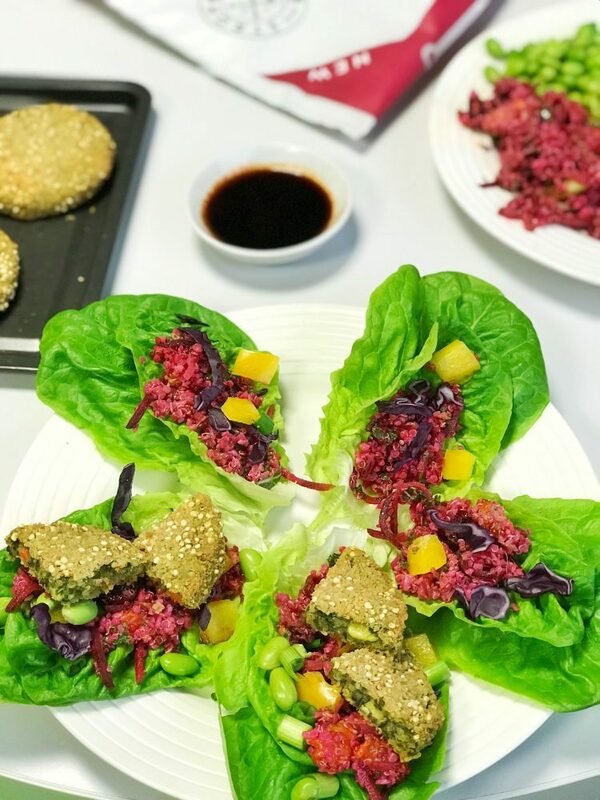 Place a spoon of quinoa into each lettuce leaf, add the yellow pepper, red cabbage, edamame beans and a half a burger.